Well, little blocks and big ones is all relative, I suppose. The big blocks are 5″, the small ones 2.5″. I think I’ve got the beginnings of a setting idea for these that may look something like this. The quilt may end up a bit larger than I originally anticipated as each time I start to stitch one block, I can’t stop until I’ve stitched at least 2 or 3. Then we get to the biggest blocks of the post. These will finish at 9″, which seems enormous in comparison to the little cake stand blocks. Another amazingly quick block to stitch. I’ve had some ideas regarding a setting for these blocks and, as soon as I get another 3 of them done, I will start playing with layouts. Over the past few weeks, I’ve been thinking a lot about why I quilt. For me, it’s not about making bed coverings although if there’s a new baby or a friend in need of comfort I’ll definitely make a quilt for them. Generally speaking though, for me making blocks and tops is all about playing with fabric and ideas and just the sheer joy of stitching and watching fabric that I’ve cut into small pieces and sewn back together again start to form patterns that I find endlessly fascinating. It makes me think of the quilters of the past and wonder what motivated them to create their quilts. Was it mostly for practical purposes so that their families would have warm quilts under which to sleep? Was it because they too were fascinated by the patterns? Or was it a combination of both? 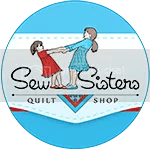 It’s impossible to think that they were motivated solely by practical considerations when one sees the beautiful quilts they created. Smudge was lounging in his kitty bed. 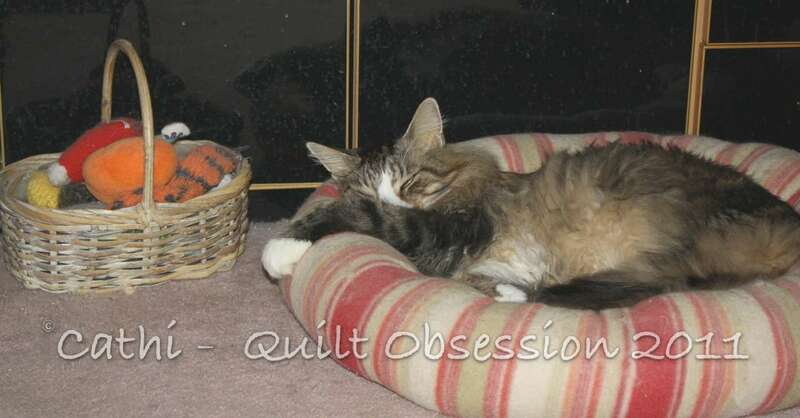 The paw draped over the edge makes me smile. Love all the blocks! I agree with you, for me it is a lot of the same reasons, plus the fact that it is very therapeutic to stitch. Think about placing a small block in the point next to the larger blocks – you might like that more than a large setting triangle. 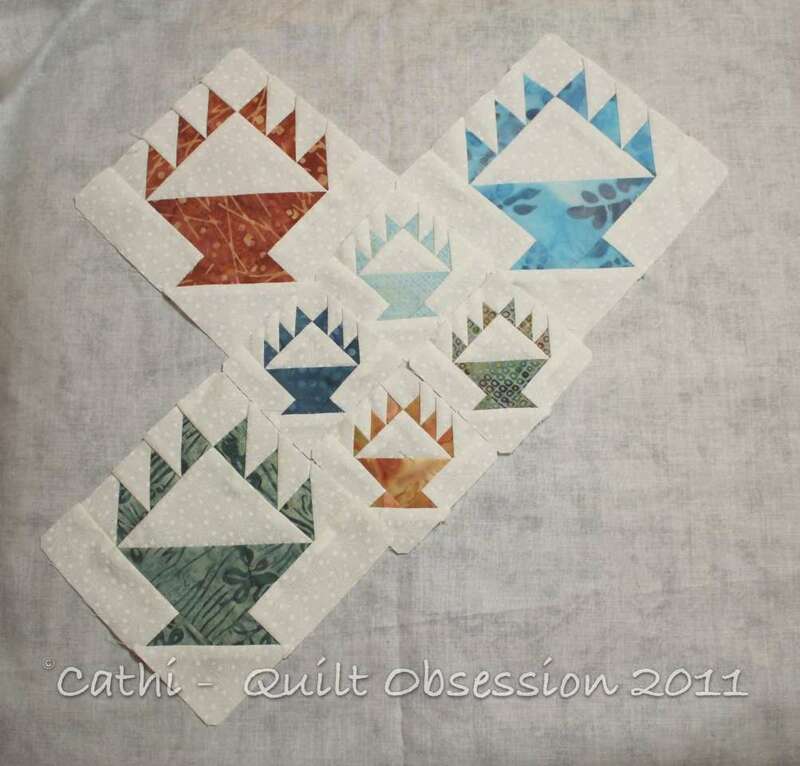 Wonderful blocks Cathi. You do make them so beautifully. Lovely blocks! I quilt because I like to play with colour and design, I am not talented at drawing so I get my artistic pleasures in other ways. I always enjoy seeing what you are up to…I love the big and little blocks together. Love the basket blocks! 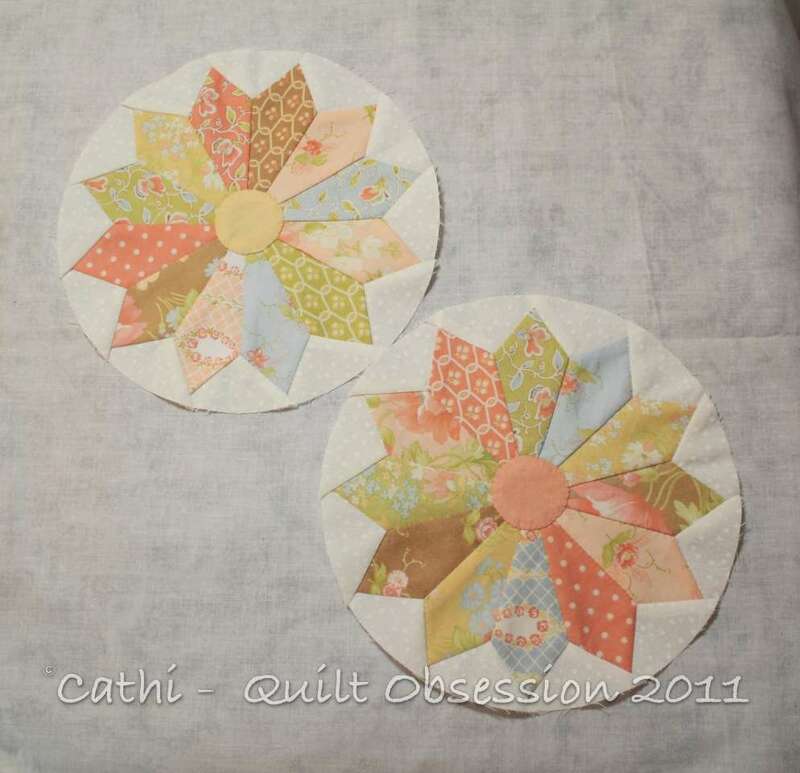 For me making quilts is all about the process, that’s why I have a stash of quilt-tops waiting to be basted and quilted. DELICIOUS! Blocks both large and little 🙂 Both are so different in fabric choices too. Love them! Such a cute picture of Smudge 🙂 so happy he’s picked up. Oh what a great thought! I never considered that they might be making such wonderful, detailed, grand quilts simply for bed coverings. It reminds me the more things change, the more they stay the same. I like to think they were just like us. We’re women. Are we so different today? Our hearts are the same, aren’t they? They made quilts because (1) they needed them and gifted them and then (2) they enjoyed watching beautiful patterns come to life. They enjoyed being around other women and working on a shared art form. It was the time they could be together. Much like we do today. We make them to use & gift then we make them to create art and share with our friends! I love that part. 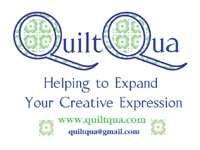 I love the shared quilting ideas and chatting with my inspirational friend. For me it is the color!! and the planning and the lovely patterns and , o , i guess it is all of it. I know, piecing and quilting are very relaxing and it allows you to get creative in your own way. I think in days long past there was probably a split of reasons just like there is now. I deal with students who will only make queen size quilts because why would they waste their time otherwise. 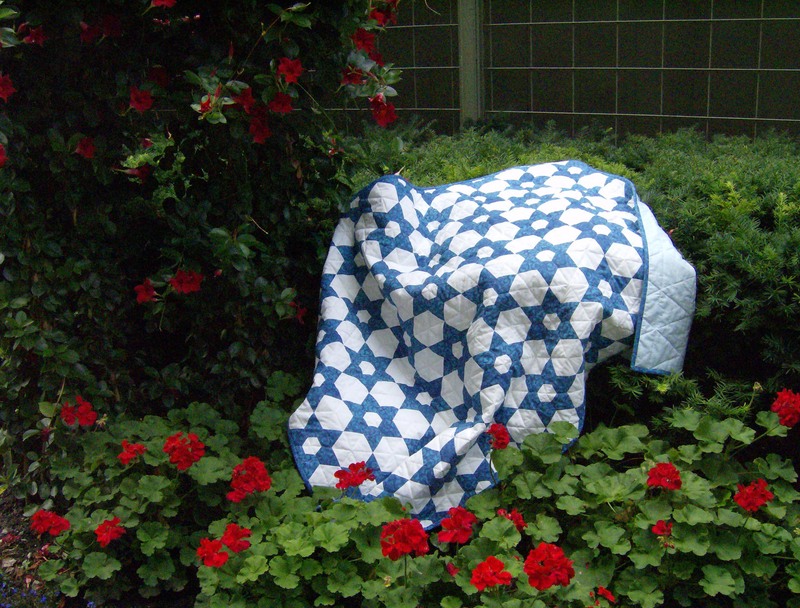 Then there are others who will never make their fun blocks into sizeable quilts. I’m sure there were lots of ladies in the past that just loved the motion of making blocks whether they finishing anything or not. Seeing Smudge always makes me smile. I love the cake stand blocks too. Seeing the paw just makes me smile too. I’m really loving your pointed Dresdens. It’s going to make an absolutely gorgeous quilt. And Smudge looks boneless in that picture. Those blocks are absolutely darling! That Smudge, he does well at maintaining his Louging title LOL.